Member draw using the Halloween theme. Raffle draw using the Golf theme. Reverse Raffle name draw using the Lawn Bowls theme. Member draw using the Baseball theme. THIS UNIQUE RANDOM NUMBER GENERATOR PROVIDES CLUBS, PUBS, SCHOOLS, MEMBER BASED ORGANISATIONS AND EVERYONE WHO RUNS A RAFFLE A FUN, PROFESSIONAL AND EASY WAY TO INVIGORATE FUNDRAISING. Using Club Raffle will save time and reduce problematic manual raffle draws. It's unbiased random generator will select numbers or names from your specifications and display them in a fun and exciting format for your members. Raffles, Reverse Raffle (Last Man Standing) & Members Draws – multiple formats are available for your lucky number or name draws, all customisable to your needs. Specify your ticket numbers, reverse the order winners are drawn, automate the entire draw so no user intervention is required. It’s all possible with the Club Raffle software package. Advertise your sponsors to offset the cost of raffle prizes, advertise upcoming club events – it’s all customisable with the simple to use options, simply set and forget. Some big screen Plasma’s have issues with screen burn-in, this can happen when a static image is left on screen for an extended period of time. The image can remain burnt into your screen forever … With Club Raffle you can enjoy the benefits of computerised random raffle’s without being worried how it will affect your expensive investments. Setup the inbuilt screen saver and away you go … the screen saver will continue to promote your sponsors while reducing any risks to your screen at the same time. If combined with the automatic draw scheduling you can set and forget everything so staff and/or volunteers need not worry about how it all works. Download the software now and be ready to run a raffle within minutes … intuitive design combined with simple question & answer style options mean you can be up and running in minutes. You can download the software FREE now, no strings attached. If you need more help or perhaps more information visit the Help section for a screen by screen walkthrough. 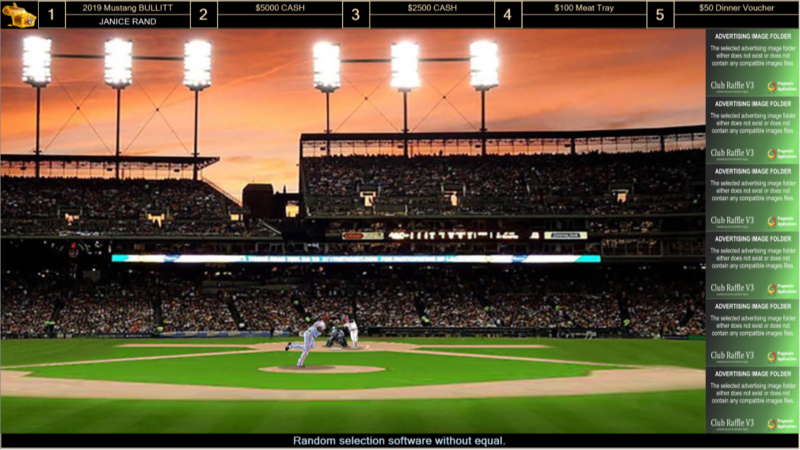 THE CLUB RAFFLE SOFTWARE HAS A FREE AND Licensed versions. TEST IT OUT FOR YOUR SPECIFIC NEEDS, YOU CAN BE UP AND RUNNING IN MINUTES. WHEN YOU DISCOVER HOW EASY IT IS TO USE AND THE MULTITUDE OF BENEFITS IT CAN PROVIDE YOUR CLUB WE’RE SURE YOU WILL WANT TO CONTINUE TO USE IT FOR YEARS TO COME. REVIEW THE FEATURE LIST TO SEE THE SPECIFIC DIFFERENCES BETWEEN THE FREE AND Licensed versions OF THE SOFTWARE. 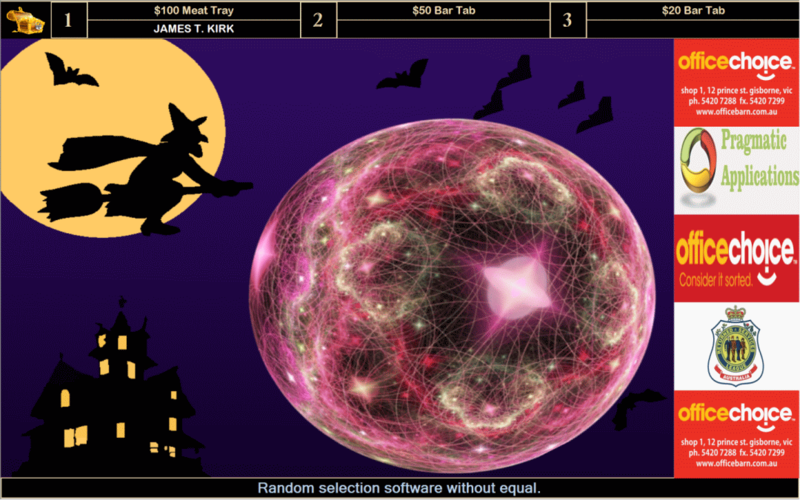 Club Raffle – Unique random number generator software is under active development. New features and theme's are being added all the time. Add some fun with sound effects and voice calling of winners. 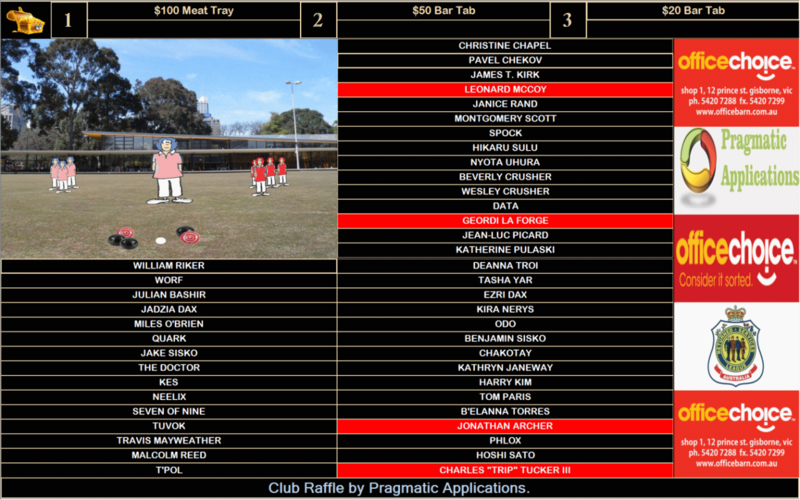 Using the Text to Speech technology built into Windows the Club Raffle software can even read out the winners for you. Club Raffle is designed to be used with the common & cheaply available raffle ticket books you can get at most stationery stores, of course ticket numbers are completely customisable in the software so you can use almost any ticket numbering system you wish. PREREQUISITE: Club Raffle is built using Microsoft .NET technology and requires you to have .NET installed on your computer before it will run. Microsoft .NET is available free from Microsoft and is normally already installed and updated on your PC. During installation Club Raffle will check your PC for the required version of .NET and start the installation from Microsoft if needed. Download the Club Raffle software FREE and give it a try for yourself. No pre-registration is required, no forms to fill .. simply download the FREE software and install it onto your computer. 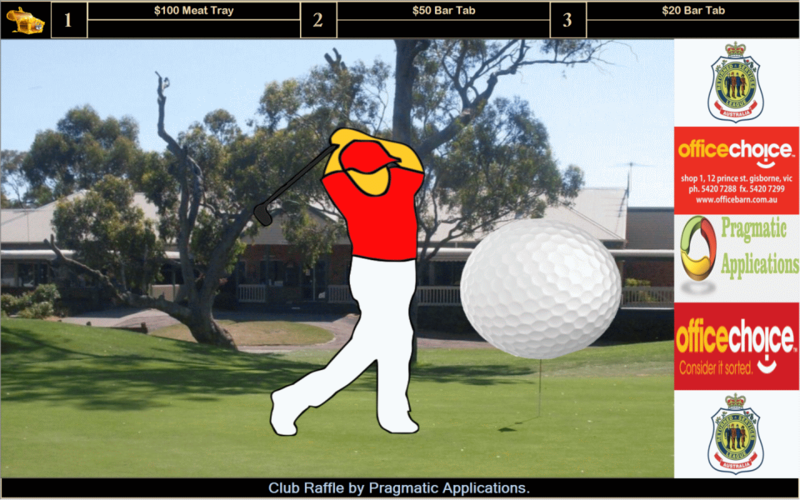 CLUB RAFFLE HAS BEEN DESIGNED TO PROVIDE CLUBS AND MEMBER BASED ORGANISATIONS THE ABILITY TO MODERNISE AND SIMPLIFY FUNDRAISING ACTIVITIES. THE APPLICATION WILL RUN A RANDOM TICKET DRAW IN THE FORM OF A MEMBERS DRAW, A TRADITIONAL RAFFLE OR REVERSE RAFFLE(LAST MAN STANDING) FORMAT. LOAD IT ONTO YOUR PC OR NOTEBOOK, PLUG IN YOUR PROJECTOR OR OTHER BIG SCREEN (IF YOU WISH) AND RUN A PROFESSIONAL AND FUN RAFFLE FOR YOUR MEMBERS AND RAISE FUNDS AT THE SAME TIME. The application is available as a FREE version, or you may purchase a registration (Standard or Professional), in all versions you have complete control over the setup of each type of draw, that is to say the FREE version is not crippleware .. it is completely functional. When I created this application I was unable to find a suitable program on the web and those that I did find were basically "crippleware" ... The only limitation in the FREE version is limited themes, advertising and a few advanced features. In either of the Licensed versions (Standard or Professional) the application provides the opportunity to promote your sponsors with banners and images that remain on screen before and after a raffle draw. In addition to all available animation themes. The initial application contains default images, such as my local Golf clubhouse in the background of the Golf theme, these may be changed to any image you wish by simply replacing the image with your own and setting the new image location under the DIY theme settings. In the Licensed versions you may also change the welcome image, add advertising images used by the in-built screen saver, business card images and customise a text file that acts as a rotating banner during the draw. Club Raffle contains many opportunities for you to support your sponsors and/or generate advertising revenue. Review the Feature List to see the specific differences between the Free and Licensed versions of the software.